It's President's Day and the perfect time to get together with other blogs to celebrate! 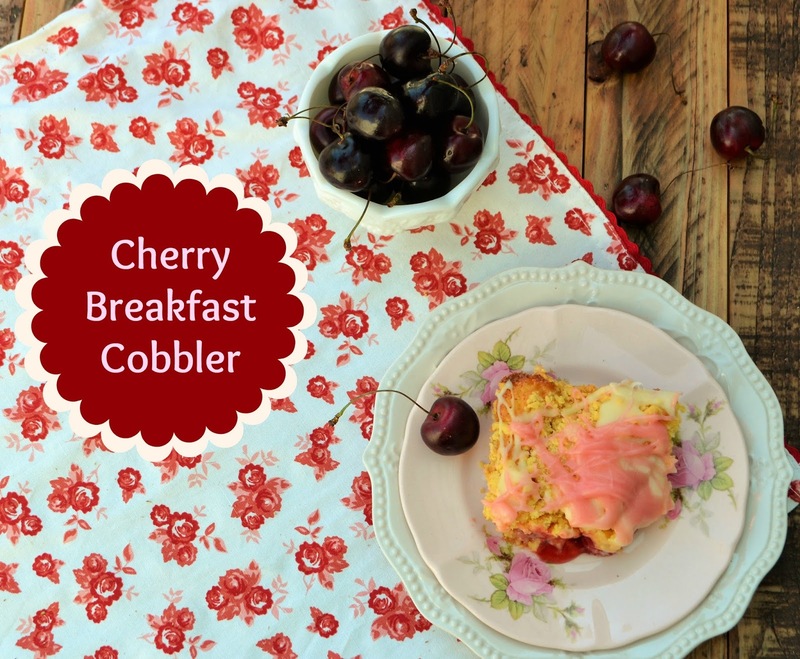 We are all sharing Presidential themed recipes, and the perfect reason to share Washington's Cherry Breakfast Cobbler! It's not only scrumptious, it is easy to make and perfect to take to morning meeting or potluck. The antique pink china plate is from my Grandmother, and the antique white milk glass bowl from my step mom. Fun Fact! George Washington is my first cousin.. ok 7 times removed! His mother and my ancestor were sisters! Now how cool is that! 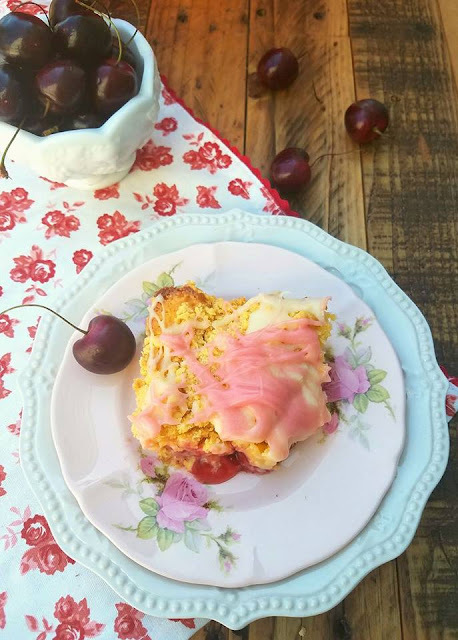 When I had a chance to share Presidential themed recipes on President's day, I knew I had to do a recipe with my cousin in mind, and Cherry's seemed natural with the story of him chopping down the Cherry tree, even if it wasn't really an accurate story! ha ha.. But, this Cherry Breakfast Cobbler Coffee Cake from Can't Stay Out of the Kitchen, is just really delicious and will please a crowd for sure! Jan's Tip: I reserved a little bit of the cherry pie filling from the cobbler, (probably just under 1/4 cup) and scooped the pie filling "goo"away from the remaining cherries and stirred it into some of the icing. I drizzled half the vanilla icing over the cobbler and then stirred in the pie filling in the remaining half of the icing, and drizzled cherry icing over the top of as a final "cherry pink" glaze. (For the photo shoot, I did bump up the pink just a tad with a 1 drop of red food coloring). In mixing bowl, measure 1 1/2 cups of the cake mix. Add in 2/3 cup milk and eggs. Stir well. In separate bowl, cut butter into remaining cake mix with pastry cutter or two forks until crumbly. Sprinkle Butter crumble over filling. Bake for 30-40 minutes till golden brown or till done. Whisk powdered sugar and milk together for icing. Start with 1 tbsp. first and mix until you can’t mix any more before adding any more liquid. Jan's Tip: Go for a thick icing.. it will stick to the top of the cake, and wait till it is cooled completely before drizzling it, or it will just sink into the cake and although delicious, won't "look" iced. Here are some other Presidential recipes to try out too! I love genealogy and how fun to say you're related to our first President! I'm sure he would approve of this breakfast cobbler. Looks delicious. What pretty pictures!! Well, happy Presidents Day to your cousin! This looks like a lovely way to honor him. I love that you used some of the cherry filling to color and flavor the glaze. I know I would love a healthy helping of this for sure!